AT PHYTEC we bring designs to life. 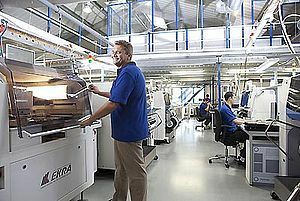 Our company philosophy includes a in-house production at our headquarters in Mainz, Germany. Our manufacturing equipment, ISO 9001/2008-certified processes, cost model and Enterprise Resource Planning (ERP) system enables us to cost-effectively and flexibly manage high-mix, low-to-medium volume (HMLV) manufacturing. This HMLV approach best supports our wide product palette, as well as best meets the delivery demands, quality requirements and customization needs of our diverse customer base. 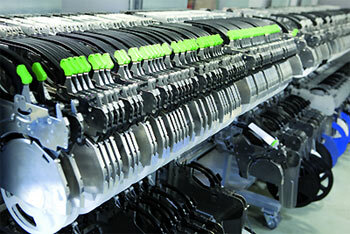 In addition to PHYTEC's own production needs, our production capacity is reserved for customer projects. We offer competitive pricing and due to our flexible shift operation management we can react quickly to changes in demand. 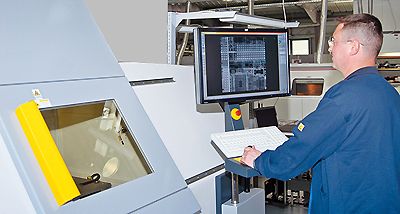 PHYTEC's cutting-edge technology and highest quality equipment guarantee an excellent level of production quality and efficiency. We will be happy to show you around our production hall during your next visit at PHYTEC headquarters. We manufacture in a double-sided SMD (Surface Mounted Devices) process. Our wave soldering machines offer traditional THT (Through Hole Technologie) and our selective soldering machine offers a mixed mounting process including SMD and THT. We manufacture in a no clean process according to J-STD-004. We carry out a visual inspection for every board. We carry out a functional test for every board. PCBs are manufactured externally in agreement with IPC-A-600F class 2 or class 3. We manufacture our products in agreement with IPC-A-610D class 2 ‘Acceptance criteria for electronic assemblies’, new product even in agreement with class 3. We manufacture in a no clean process in agreement with J-STD-004. PHYTEC is certified by TÜV (German Technical Inspection Association) according to ISO 9001:2000. PHYTEC has been certified according to VDA2 and KTA1401 by customers.